More than 14 million people in the east Africa region require urgent food aid due to drought and spiralling cereal and fuel prices, aid agencies say. In an emergency appeal launched today, Oxfam warns that millions of people in Ethiopia, Somalia, Uganda, Djibouti and Kenya are fast being pushed “towards severe hunger and destitution”. Earlier this week the UN said it needed £200m to avert a humanitarian disaster. The hunger crisis is worse than the last regional emergency in 2006, when drought caused 11 million people to need assistance, because of the added impact of the global food price increases. Poor families are struggling to buy staples such as maize and wheat, which have more than doubled in price over the past 12 months. 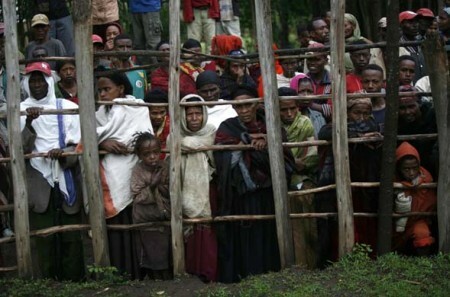 Ethiopia is worst affected, with more than 10 million people requiring assistance following two poor rainy seasons. About 4.6 million need emergency food aid until the next harvest in November – rain is now falling in some areas – while a further 5.7 million on safety-net programmes require additional food or cash grants. 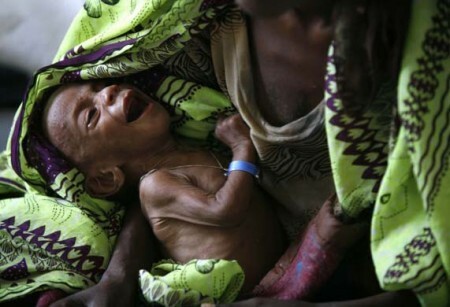 At least 75,000 children are suffering from severe acute malnutrition. The sharp increase in the fuel price has added to the cost of getting food around the country. Oxfam says that in the remote Somali and Afar regions, cereal prices have increased by up to 500%, while livestock are dying due to lack of water. In Somalia the rice price has more than tripled since May 2007. Drought and mass displacement caused by civil war mean that 2.6 million people require food aid – a number that could rise to 3.5 million. Delivering the relief is difficult due to piracy and the targeting of aid workers by militias. In Djibouti 115,000 people require assistance, while in Uganda’s eastern Karamoja district, the figure is 700,000. In Kenya, 900,000 people need help. Normally, the WFP buys relief food from regional governments, but is having to import food from India and South Africa. The Ethiopian government has used up its emergency cereal reserves to feed the urban poor, while Uganda and Kenya are reluctant to sell the small stocks they have. 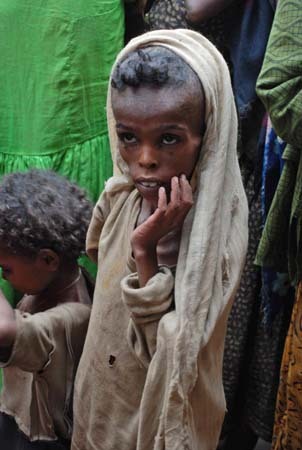 Earlier appeals by the UN for help in tackling the Somalian and Ethiopian food crises have only been a third funded. Barbara Stocking, Oxfam’s chief executive, said the UK public had the right to question why the appeals “happen year after year”. “The answer is that the world consistently fails to address adequately the underlying causes of these crises. Chronic poverty in a world of gross inequality of wealth and opportunity lie at the heart of these cyclical crises,” she said.